AMD just announced that Catalyst drivers with FreeSync support will officially debut on March 19. Project FreeSync is AMD’s effort to bring variable refresh rate monitors to market through industry standards and by working with established ASIC and monitor manufacturers. AMD proposed the Adaptive-Sync standard earlier in the year to the VESA body. Which has since been adopted and incorporated it into DisplayPort1.2a. Adaptive-Sync capable monitors featuring Nvidia’s G-Sync and AMD’s FreeSync technologies solve three distinct issues in games. The first issue is tearing, tearing occurs whenever your game’s frame rate is mismatched to the refresh rate of your monitor. Which is the result of your graphics card producing a variable frame rate. No matter how fast your gaming system is it will always produce a variable frame rate. This is because some frames i.e. images are very complex and would take longer than usual to process, while other frames are more simple and thus are processed much more quickly. The second issue is somewhat related to the first, as stuttering can occur if your framerate dips below the refresh rate of your monitor when V-Sync is enabled. V-Sync works to match your game’s framerate to the refresh rate of the monitor by forcing each frame to wait for the next refresh cycle before it is drawn onto the screen. This is to prevent two frames from being drawn at once in a single refresh cycle which causes tearing. The third issue is input-lag, which is the result of that “waiting” period that each frame has to go through before its drawn on the screen when V-Sync is enabled. So before variable refresh rate monitors had existed, irrespective of whether they were G-Sync or FreeSync enabled. You had to choose between either tearing and stuttering or latency. AMD is very excited that monitors compatible with AMD FreeSync™ technology are now available in select regions in EMEA (Europe, Middle East and Africa). We know gamers are excited to bring home an incredibly smooth and tearing-free PC gaming experience powered by AMD Radeon™ GPUs and AMD A-Series APUs. 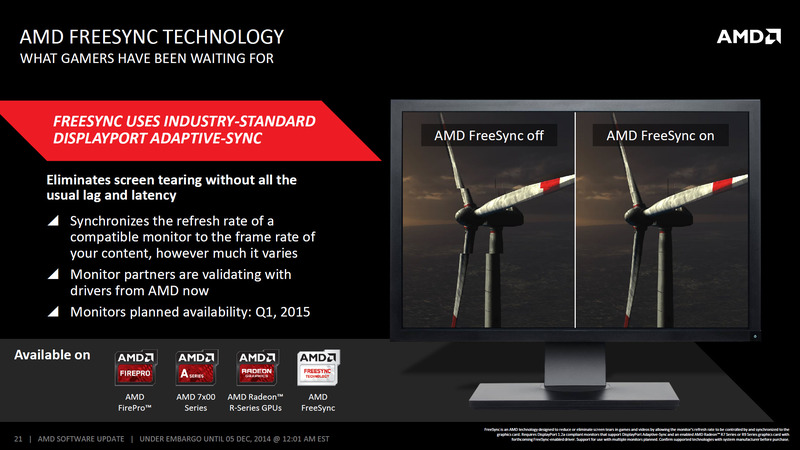 We’re pleased to announce that a compatible AMD Catalyst™ graphics driver to enable AMD FreeSync™ technology for single-GPU configurations will be publicly available on AMD.com starting March 19, 2015. Support for AMD CrossFire™ configurations will be available the following month in April 2015. FreeSync can support any range of refresh rates, for example 24Hz-144Hz, 24Hz-90Hz or even 24Hz-240Hz. And depending on the monitor maker they can opt for whatever range they want. So you can have all sorts of FreeSync monitors that span from the very high end 4K models to the 120Hz/144Hz “gaming” 1440p monitors and the more affordable 90Hz 1080p solutions. Which means that you will more easily find something that fits your needs and budget. There are currently 11 different FreeSync monitors which are already available or will be available by the end of the month. Some of the ones which are already available right now in Europe include the BenQ XL2730Z, LG Flatron 34UM67 and Acer Predator XG277HU.